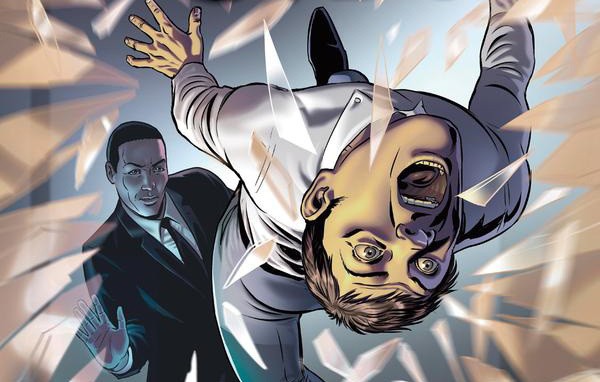 RIVERS OF LONDON #3.3: Black Mould, Part 3 Review @comicstitan | Warped Factor - Words in the Key of Geek. Who you gonna call? asks Tony. 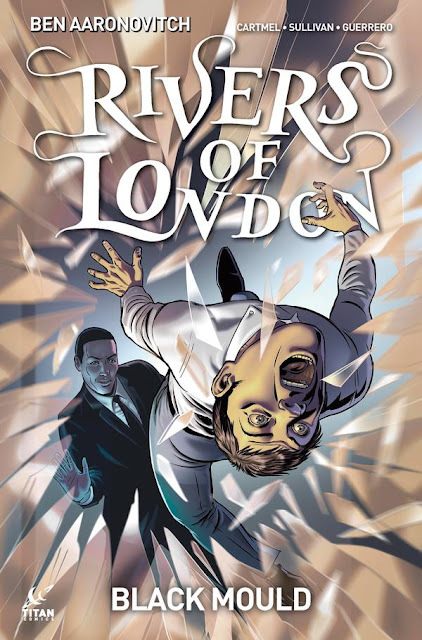 Of the three story-arcs in the Rivers of London comic-books so far, Black Mould is by far the most creepy. I mean, really – this is ‘Don’t read last thing at night’ creepy, especially if you haven’t given your living environment a solid scrub-down in the last few days. Mould is such an accessible source of potential scares, and the capacity of this particular mould, to grow from almost nothing into a giant, tentacular, wraith-like bundle of bad intent is inherently terrifying because it means it could hide from us almost all the time, like a tarantula that can hide as a perfectly innocent smudge until you look away, then grow and grab you when you’re not looking. Put the two elements together with some sort of guiding, malignant intelligence, and you’re on to a winner. It’s the kind of thing that could have, and should have appeared in Torchwood, bringing potentially supernatural terror to the urban environment. So it’s fair to congratulate writers Ben Aaronovitch and Andrew Cartmel for coming up with this story-arc. Issue #3 takes the story of the mould with a mind of its own forward to some degree. Last time we saw PC Peter Grant, Metropolitan Police wizard, he was about to have his brains smashed out with a cricket bat while investigating a property that might have had the mould of fear in it – it’s worth remembering that this particular black mould has the gift of making you ‘remember’ your worst times, your darkest fears, even to the extent of remembering things that didn’t happen. The beating that was waiting for Peter, we can exclusively reveal, did happen, or would have done. But as any Warcrafter would tell you, a well-cast spell and a punch in the nuts will beat any cricket bat any day, meaning Grant and his partner Guleed suddenly have three suspects to question. There follows a perfectly believable evocation of modern British racism – the thugs, some of whom are ‘perfectly respectable businessmen’ didn’t understand that Grant and Guleed were the police because they don’t ‘look like police,’ which means they’re not white, so they were fair game, particularly as the thugs were there to give a sitting tenant, a Mr Khan, a good going-over to encourage him to move out. Importantly though, they’d been paid to do that, giving the two London coppers an excuse to return to the swanky estate agents who were dealing with the earlier tower block of mouldy doom they investigated. It goes without saying that the swanky estate agents deny any culpability in the beating, leaving three mouldy properties for Grant and Guleed to investigate. Then, out of nowhere, Beverley Brook, water goddess and sometime-girlfriend of Grant calls him up for a chat while in the middle of getting rid of some black mould off her ceiling. Coincidence? Yes, probably, but Aaronovitch and Cartmel pull off this brazen plot advancement pretty well by simply staring us out and saying ‘Yes, this happened, deal with it.’ Bev and Maksim, a Russian toyboy left over from the previous Night Witch arc, join Peter in the quest to exterminate the mould, which…after some very vivid, positive daydreaming from Maksim and no feelings of fear around the mould, is dismissed as…erm…just mould. It not being just mould is proved to us by a two-page final scene that will seriously unnerve the bejesus out of readers, involving some unzipping and some shiny things. More to the point, evil artist and colourist, Sullivan and Guerrero taking what is already a creepy-as-hell idea and pushing it to the edge of sanity, with the Big Bad assuming a life of its own in this issue, and for reasons we won’t spoiler you with, making its intelligence feel more active, more real and closer to our own. Sullivan’s always been an artist who delivers his comic-book worlds in blu-ray detail, and this issue’s no exception – his built environments, and there are many of them here, look believable and in keeping with the areas in which they’re supposed to be. His characters can get away with using gestures and facial expressions to carry scenes and tones – that may sound obvious, but you’d be amazed how rare a skill that is. Guerrero’s mastery of colour and light help make the scenes feel like we’re there – a particularly interesting experience during Maksim’s flashbacks of money-flinging coke-orgies with hookers in his Russian days! – and when the mould gets a move on late in this issue, the two talents are combined, plugging directly into the imaginations of Aaronovitch and Cartmel, and indirectly into those of every reader of the comic-book, turning the everyday into the creepy-as-hell with the turning out of a light and the rise of the mould in a new form that brings some classic horror movies screaming to mind. Get Rivers of London #3 for the quality of the villain, the social commentary, and the kickass art and colourwork. Just…make sure it’s daylight when you read it. And if your house is spotless, that probably wouldn’t hurt either.